This guide is for Famicom version of the game. For the original version, see Mugen Senshi Valis. 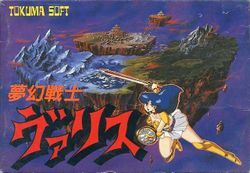 Mugen Senshi Valis for the Famicom is a reinterpretation of the original version released for popular Japanese home computers like the MSX and PC-88. It was published by Tokuma Shoten in 1987, a year after the original game was published. Although the Japanese title, 夢幻戦士ヴァリス, is usually translated as "Valis: The Fantasm Soldier", the title screen for the Famicom version says "The Fantastic Soldier" instead, because the word Mugen can also mean "fantasy". This version of Valis is still primarily a side-scrolling platformer which stars a Japanese schoolgirl named Yūko Asou (麻生 優子, Yūko Asou? Asou Yūko). Yuko must a mystical sword called Valis to defend Earth, the spirit world and the dream world. Unlike the original version, Yuko must explore several different regions which are composed of intersecting streets and paths, many of which are not straight. While you may enter one path heading East, you may exit that path heading North, and there is no visual indication besides the map to let you know that your orientation has changed, making charting your progress through the levels extremely difficult. Therefore, finding the map is one of the most important tasks in the game so that you don't wind up completely lost and running in circles. Unfortunately, finding the location of many items is quite a difficult task as well. This version was the first remake of the original game, but not the last. It was next remade for the Sega Genesis, where it reverted to a straightforward linear run and slash game with better graphics. After the final game of the series was published, it was released for the PC-Engine CD, which is generally considered the best remake of the game, as well as the best product in the series. The game spawned three sequels including Valis II, Valis III, Valis IV. Although this game was only released in Japan, the game was fan-translated into English in 2007. The translation patch is available here. In addition to translating the game, the same team saw fit to address some of the more difficult aspects of the game that they considered less fun, and released an enhancement patch. The patch, known as Valis++, is available here. There are many multiple dimensions that overlap one another. The real world that we live in is one of those dimensions. Each world has maintained its independence with no dimension influencing any other up to now that's the power of a body of energy known as "Valis." Valis is contained in stones known as "Phantasm jewelry." Its power is supplied to all dimensions, and the stability of those dimensions is maintained. However, it is not easy distribute that power equally across dimension which undergo rapid expansion. Valis has the power to amplify the energy of those who obtain it. As the energy was divided into each dimension, it became necessary to seek out those who could wield its power. In one dimension lay the fantasy field of Vanitei. In this field was a princess known as Varia. Varia accepted the obligation of controlling the power of Valis, and employed the sense of balance and a spirit of equality. She was perfectly suited as the controller of power. Varia promises to cooperate with Valis in whatever form it takes across dimensions. One sword known as the Valis Sword was given the power to defend the innocent from wickedness. As the power controller, Varia continued to send the power of Valis equally across all dimensions and times. Expanding dimensions were stabilized, and Varia was hailed as a savior. However, this did not continue very long. Even Varia had limits, and her body suddenly collapsed. As the power controller, Varia's only mission is to maintain existence. It was true that it would be impossible for her to accomplish her mission beyond death. Her spirit was panic-stricken, and the power that she supplied began to lose stability. This created a distortion in her dimension, which stopped Varia from preventing those who would pass between dimensions. A devil known as Rogels began to obtain Valis. He invaded one dimension after another, until he was able to capture Varia. He discovers her Phantasm Jewelry and tries to take it from her, but he destroys it by mistake. The jewelry is divided into five parts, collected by Rogels and various dimension devils' hands. Valis had broken free of its container. A dimension will collapse if the supply of power stops flowing to it. To look for a new power controller, Valis must find people who have the power to wield it. Five swords were shot to the outskirts of the dimension. One of the more ordinary swords reaches our real world, and it received by a high school student named Yuko. Is Yoko really cut out to be soldier of Valis? Will she be able to save Varia and the fantasy field that she comes from? This page was last edited on 28 May 2017, at 20:51.